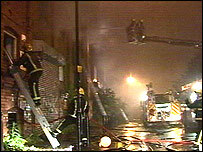 A fire has badly damaged a derelict warehouse in Bristol. It took 30 firefighters several hours to tackle the blaze in a warehouse close to the ss Great Britain on Sunday night. Several youths were seen by a local resident leaving the building, shortly before he raised the alarm. Two homeless people sleeping in the warehouse escaped before the blaze spread. An investigation has been launched by the fire service.